I found this article to be interesting because of several roof failures we have seen here in the Durango area. The article mentions some of the larger structures that have collapsed recently, but I am aware of a lot of problems that do not make the newspaper. While roof failure is a significant possibility, there are other reasons for not wanting tons of snow on your roof. Many roofs are leaking from snowmelt and ice dams. This is a serious problem that can cause thousands of dollars in damage to your home and it’s contents. Gardenhart Landscape & Design has worked on several roofs to remove the snow and thus stop the flow of melting water into the residence. Another concern of mine is snow accumulating on manufactured homes and modular structures that are not constructed for snow loads typically found in Durango and the surrounding La Plata County area. Many of these homes are built in other parts of the country and transported to Durango that do not have building codes that require roofs to withstand up to 40 lbs. per square foot. So, help out your friends and neighbors, remind them to monitor their roof loads so we all can get through this winter season safe and look forward to SPRING! I really appreciate metal roofs and how they assist the snow load to move off the roof. 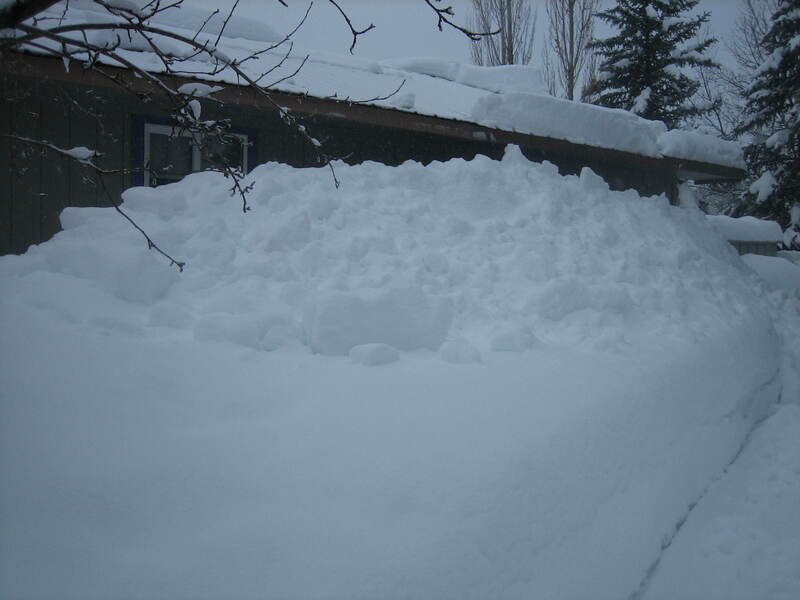 I see a lot of houses in Durango that have a shingle or shake roof that accumulates the snow. If you are thinking about building and need suggestions about what kind of roof to use, I recommend a metal roof that has a good pitch to it. This will alleviate a lot of hard shoveling and getting up on the roof to remove that load.